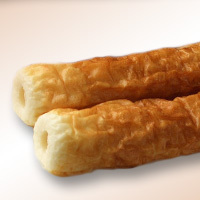 Chikuwa is a cylindrically shaped fish stick made from surumi of walleye pollock and horse mackerel containing salt, egg whites, starch, and monosodium glucosamine. It is used in oden hot pots eaten during cold winter months. It is a popular diet food acting as a low fat source of protein. The calories in Chikuwa per 30g(1piece medium) is 36 calories. Chikuwa is calculated to be 121Cal per 100 grams making 80Cal equivalent to 66.12g with 4.05g of mostly carbohydrates、3.66g of protein、0.6g of fat in 30g while being rich in vitamins and minerals such as Vitamin B12 and Sodium.